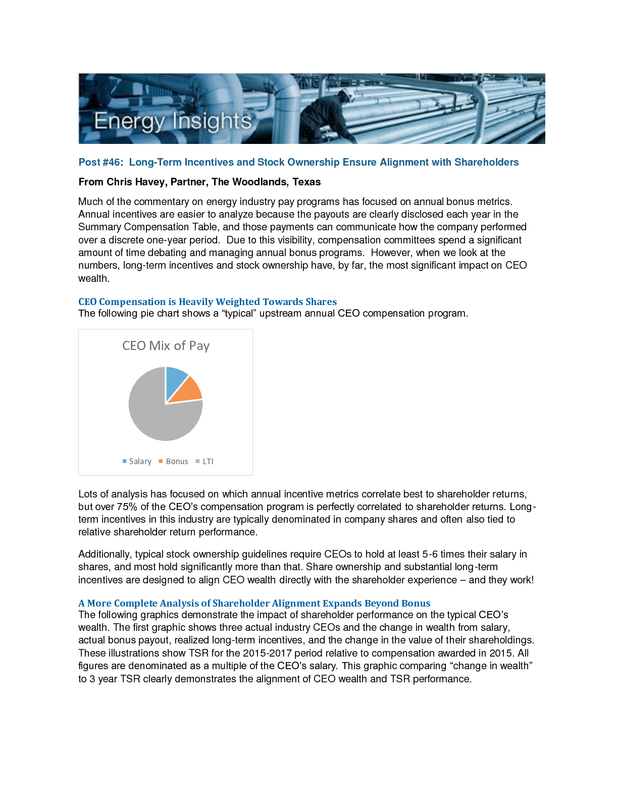 Much of the commentary on energy industry pay programs has focused on annual bonus metrics. 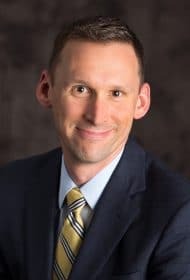 Annual incentives are easier to analyze because the payouts are clearly disclosed each year in the Summary Compensation Table, and those payments can communicate how the company performed over a discrete one-year period. Due to this visibility, compensation committees spend a significant amount of time debating and managing annual bonus programs. However, when we look at the numbers, long-term incentives and stock ownership have, by far, the most significant impact on CEO wealth. The following pie chart shows a “typical” upstream annual CEO compensation program. 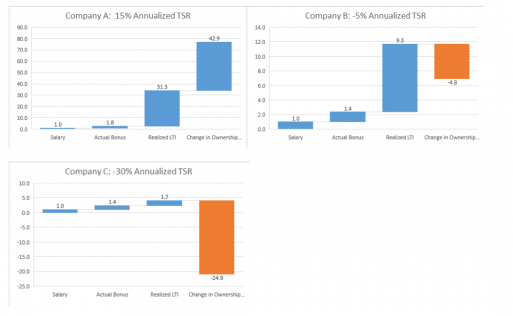 Lots of analysis has focused on which annual incentive metrics correlate best to shareholder returns, but over 75% of the CEO’s compensation program is perfectly correlated to shareholder returns. Long-term incentives in this industry are typically denominated in company shares and often also tied to relative shareholder return performance. Additionally, typical stock ownership guidelines require CEOs to hold at least 5-6 times their salary in shares, and most hold significantly more than that. Share ownership and substantial long-term incentives are designed to align CEO wealth directly with the shareholder experience – and they work! The following graphics demonstrate the impact of shareholder performance on the typical CEO’s wealth. The first graphic shows three actual industry CEOs and the change in wealth from salary, actual bonus payout, realized long-term incentives, and the change in the value of their shareholdings. 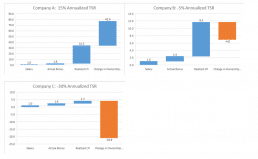 These illustrations show TSR for the 2015-2017 period relative to compensation awarded in 2015. All figures are denominated as a multiple of the CEO’s salary. This graphic comparing “change in wealth” to 3 year TSR clearly demonstrates the alignment of CEO wealth and TSR performance. 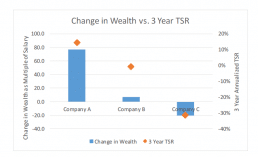 The second set of graphics breaks down the various components of the change in wealth for these three companies to demonstrate the overwhelming impact of long term incentives and share ownership. 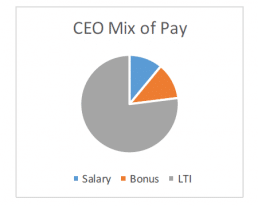 Again, all amounts are expressed as a multiple of salary and for reference, these CEOs had target total direct compensation opportunities (sum of salary, target bonus, and grant date value of LTI) of 7-8x salary. Looking at these charts, the impact of annual bonus is almost insignificant relative to the impact of LTI and share ownership. 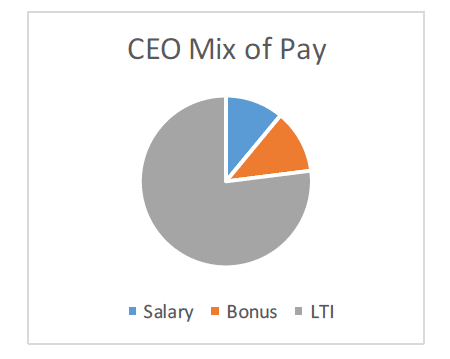 For Company A (best performer), the realized value of the LTI and the increase in the value of the CEO’s holdings combined for almost 75x salary. For Company D (worst performer), the decrease in the value of shareholdings was almost 25x salary and Realized LTI was well below his original target. I would imagine that each of these companies were scrutinized over whether they paid 50% of target or 150% of target on their bonus, but in the long-term, it didn’t matter. Annual incentive metrics serve an important purpose: communicate a company’s priorities and provide incremental annual feedback on performance. However, any analysis of compensation’s alignment with shareholders that focuses on annual bonus and doesn’t include the overwhelming influence of long-term incentives and stock ownership is incomplete. And maybe one day, the time spent by committees managing the annual bonus plan will more accurately reflect its relative importance.